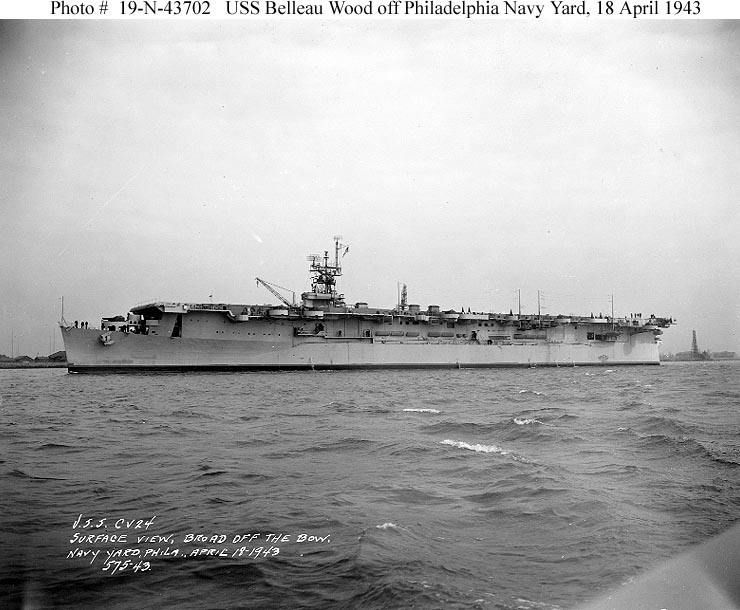 Figure 1: USS Belleau Wood (CVL-24) in the Delaware River, off the Philadelphia Navy Yard, Philadelphia, Pennsylvania, on 18 April 1943. Photograph from the Bureau of Ships Collection in the US National Archives. Click on photograph for larger image. 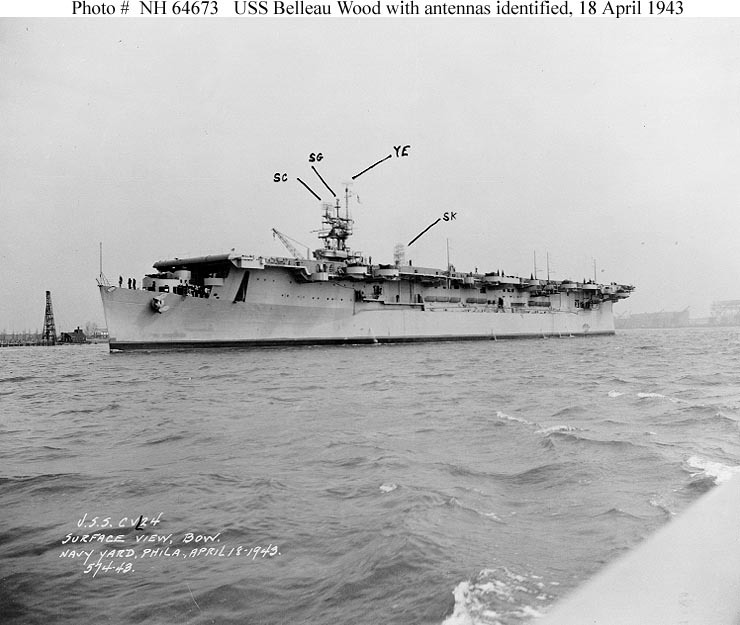 Figure 2: USS Belleau Wood (CVL-24) in the Delaware River off the Philadelphia Navy Yard, Philadelphia, Pennsylvania, 18 April 1943.This view has been marked to identify SK, SC and SG radar and YE aircraft homing beacon antennas. US Naval Historical Center Photograph. Click on photograph for larger image. 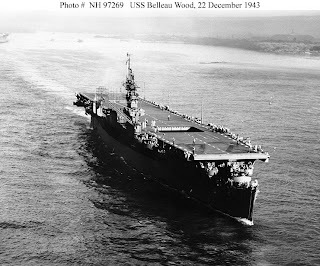 Figure 3: USS Belleau Wood (CVL-24) underway on 22 December 1943. Official US Navy Photograph, now in the collections of the National Archives. Click on photograph for larger image. 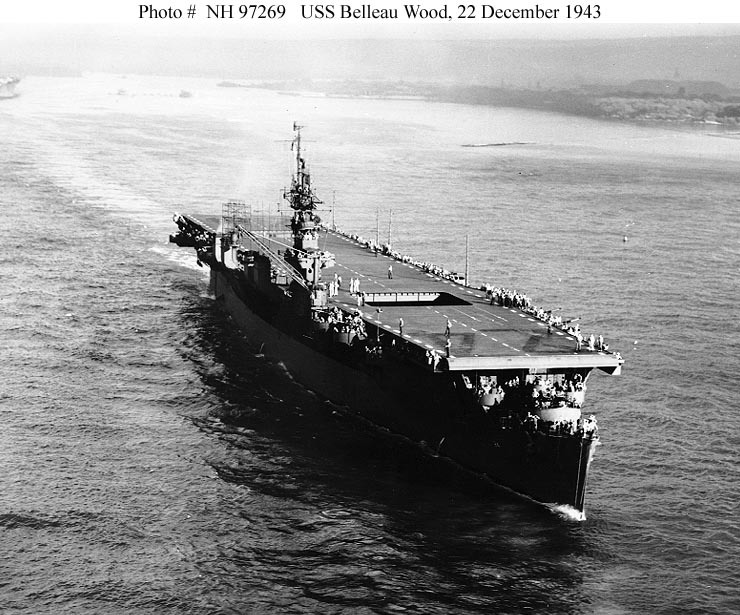 Figure 4: USS Belleau Wood (CVL-24) underway on 22 December 1943. Official US Navy Photograph, from the collections of the Naval Historical Center. Click on photograph for larger image. Figure 5: Carrier raids on the Marianas, February 1944. A Japanese bomber explodes as it crashes into the sea near USS Belleau Wood (CVL-24) during an attack on Task Group 58.2 off the Mariana Islands, 22 February 1944. Photographed from USS Essex (CV-9). Official US Navy Photograph, now in the collections of the National Archives. Click on photograph for larger image. 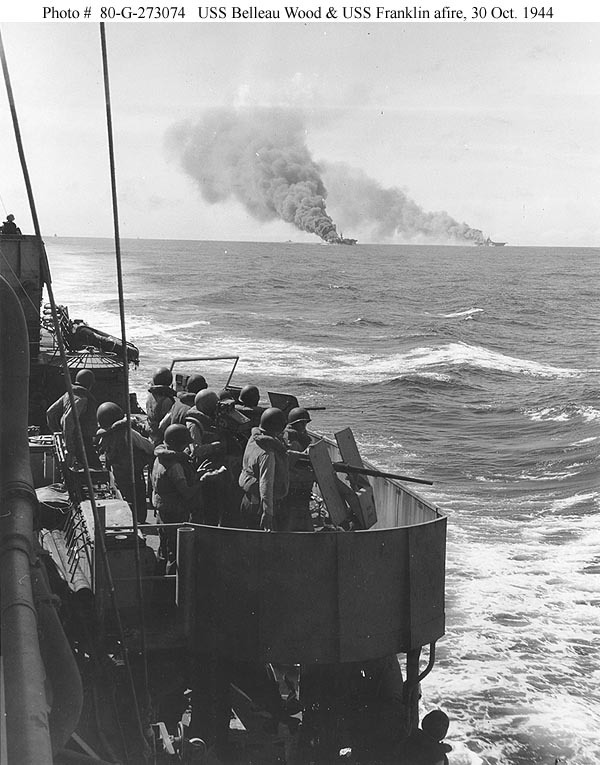 Figure 6: USS Belleau Wood (CVL-24), center, and USS Franklin (CV-13), right, on fire after they were hit by kamikaze attacks off the Philippines on 30 October 1944. Photographed from USS Mugford (DD-389), whose port midships 20-mm guns are in the foreground. Official US Navy Photograph, now in the collections of the National Archives (photo # 80-G-273074). Click on photograph for larger image. 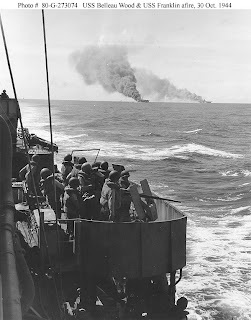 Figure 7: USS Belleau Wood (CVL-24) burning aft after she was hit by a kamikaze while operating off the Philippines on 30 October 1944. Flight deck crewmen are moving undamaged TBM torpedo planes away from the flames as others fight the fires. 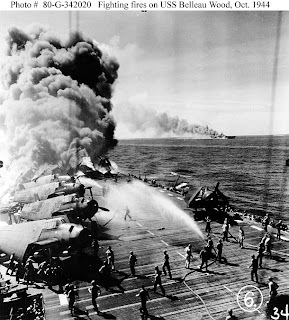 USS Franklin (CV-13), also hit during this kamikaze attack, is on fire in the distance. Official US Navy Photograph, now in the collections of the National Archives. Click on photograph for larger image. 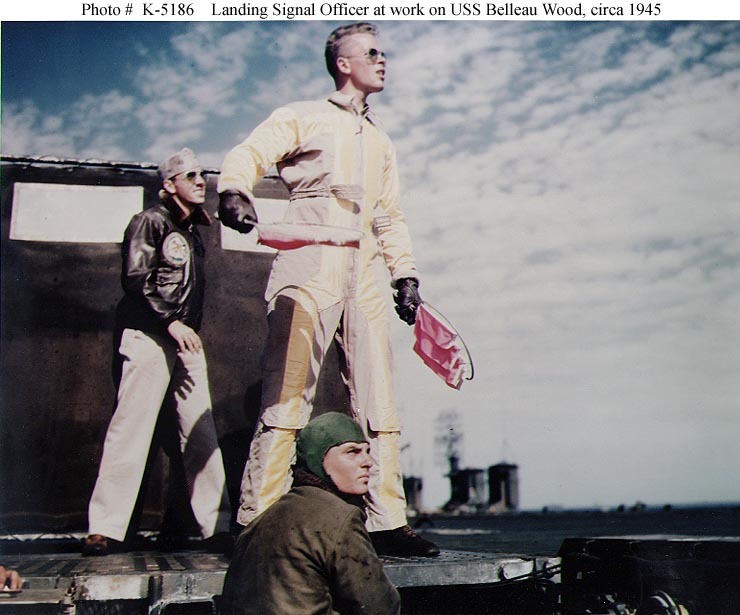 Figure 8: USS Belleau Wood (CVL-24) Landing Signal Officer, Lieutenant (Junior Grade) Walter F. Wujcik, bringing in a plane, circa 1945. Official US Navy Photograph, now in the collections of the National Archives. Click on photograph for larger image. Figure 9: French aircraft carrier Bois Belleau, formerly USS Belleau Wood (CVL-24), is moved to a berth at the Norfolk Naval Base at Norfolk, Virginia, to load aircraft in December 1953, shortly before her departure for France. Among the ships in the background are USS New Jersey (BB-62), USS Albany (CA-123), and USS Casa Grande (LSD-13). Official US Navy Photograph, from the Collections of the Naval Historical Center. Click on photograph for larger image. 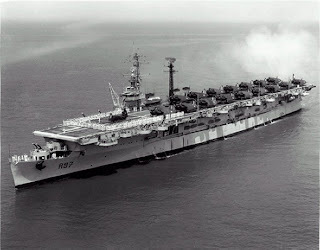 Figure 10: French aircraft carrier Bois Belleau circa 1957, with SP radar on the bridge and the French DRBV-22 antenna on the mast further aft. Location unknown. Courtesy Robert Hurst. Click on photograph for larger image. Figure 11: French aircraft carrier Bois Belleau circa 1950s, location unknown. Courtesy © Joe Radigan. Click on photograph for larger image. 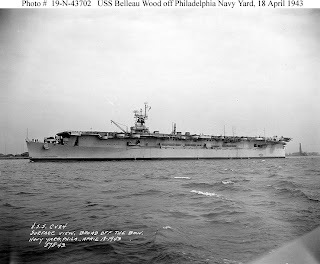 Named after the famous US Marine Corps battle and victory during World War I, the 11,000-ton USS Belleau Wood (CVL-24) was originally designed to be a Cleveland class light cruiser, but was converted into a light aircraft carrier by the New York Shipbuilding Corporation at Camden, New Jersey. The ship was commissioned on 31 March 1943 and was approximately 622 feet long and 71 feet wide, had a top speed of 31 knots, and had a crew of 1,569 officers and men. Belleau Wood could carry 45 aircraft (depending on their size) and was armed with two quad 40-mm gun mounts, nine twin 40-mm gun mounts, and 16 single 20-mm guns. After being commissioned, Belleau Wood sailed for the West Indies on 8 June 1943 for her shakedown cruise. 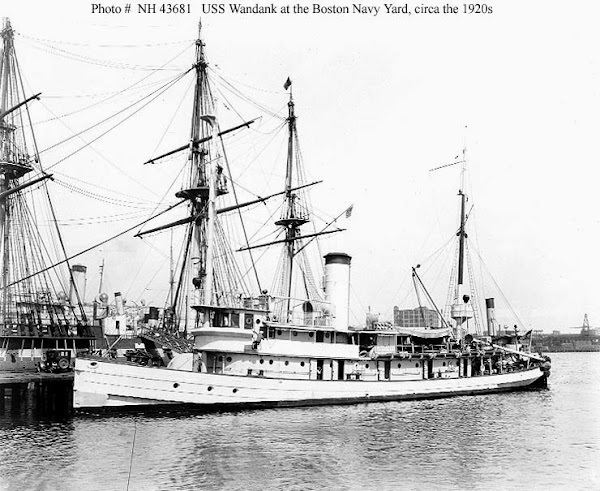 She returned to the United States and went to the Philadelphia Navy Yard at Philadelphia, Pennsylvania, on 3 July for a series of post-shakedown repairs, inspections, and alterations. Belleau Wood left Philadelphia on 21 July and steamed south, transiting the Panama Canal into the Pacific Ocean on 26 July. After staying at Panama for two days, Belleau Wood sailed for Hawaii with USS Lexington (CV-16), USS Princeton (CVL-23), and six escorts. The ships arrived at Pearl Harbor, Hawaii, on 9 August. 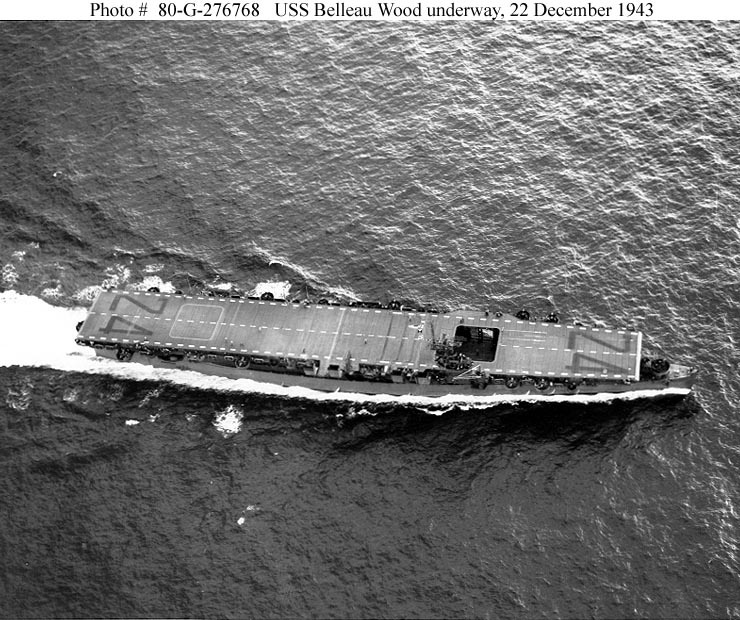 Belleau Wood spent the rest of 1943 participating in raids on Tarawa, Wake Island, and the Gilbert Islands. During the attack on Wake Island, Belleau Wood’s aircraft flew Combat Air Patrol (CAP) and Anti-Submarine Patrol (ASP) over her task force. The carrier’s pilots shot down three Mitsubishi A6M “Zeke” fighters and three Mitsubishi G4M1 “Betty” bombers based on Wake Island. However, the carrier lost two fighters during the operation, one to Japanese anti-aircraft fire from Wake Island and the other which crash-landed on the deck of Belleau Wood, killing four of the carrier’s flight deck crewmen in the process. During the first half of 1944, Belleau Wood was part of the carrier task force that supported the invasion of the Marshall Islands. She also assisted in raids on Japanese bases throughout the central Pacific, including Saipan. During the raid on Saipan, Belleau Wood flew CAP and ASP missions while the larger aircraft carriers attacked shore targets. 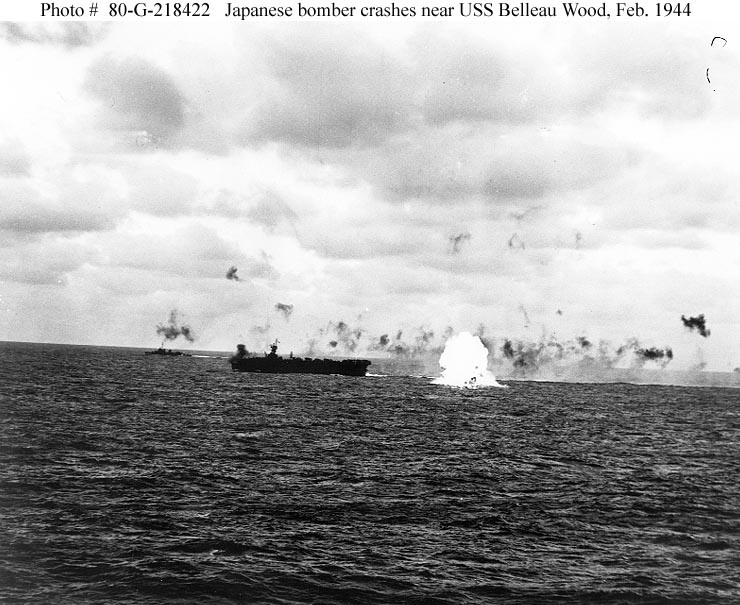 At 0830 on 22 February 1944, two Japanese “Betty” bombers surprised the task force and attacked Belleau Wood. One of the bombers started taking hits from the carrier’s starboard automatic weapons, then passed right over the flight deck and crashed a mere 200 feet away from the ship’s port beam. The second bomber also started taking hits from Belleau Wood’s 20-mm and 40-mm guns, forcing it to hit the water and explode 500 yards ahead of the ship. Belleau Wood’s gunners then shot down a Kawasaki Ki. 61 “Tony” fighter and the carrier’s CAP intercepted and shot down two Japanese light bombers that were heading for the task force. In mid-June 1944 during the Battle of the Philippine Sea, aircraft from Belleau Wood sank the Japanese aircraft carrier Hiyo, damaged another Japanese carrier, and shot down approximately 13 enemy fighters. After returning to Pearl Harbor for a brief overhaul, Belleau Wood was assigned to Task Force 58 and participated in the assaults on Guam, the Palau Islands, and Morotai (one of Indonesia's northernmost islands), and conducted air raids on targets in the Philippines, Okinawa, and Formosa (now Taiwan). During the attack on the Palau Islands, one of Belleau Wood’s Grumman F6F “Hellcat” fighters crash-landed on the carrier’s deck, killing the assistant air operations commander, Commander G.D. Cady, and two flight deck crewmen. Throughout all of these operations, aircraft from Belleau Wood attacked numerous Japanese targets on land and shot down dozens of enemy aircraft. In late October 1944, Belleau Wood participated in the Battle of Leyte Gulf. At approximately 1400 on 30 October 1944, Belleau Wood’s task force was steaming off Leyte Island in the Philippines. Suddenly, five Japanese kamikaze aircraft slipped by the carrier’s CAP and headed toward the warships at an altitude of 18,000 feet. All of the anti-aircraft gunners in the task force opened up with everything they had on the intruders. The huge barrage of gunfire shot down three of the oncoming planes, but one of them crashed into the carrier USS Franklin (CV-13), killing 56 men and seriously wounding 14 others. The fifth plane first dropped a bomb on Franklin and then pulled up and dove straight into Belleau Wood. The kamikaze crashed right into the flight deck, hitting 11 fully loaded Hellcat fighters. This resulted in a huge explosion and started large fires which took three hours for damage-control teams to get under control. The carrier now had an enormous hole in the flight deck and the explosion killed 92 men and wounded 97 others. Although seriously damaged, the ship stayed afloat and was forced to leave the area. 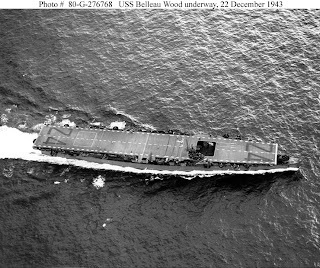 Belleau Wood made preliminary repairs at the anchorage at Ulithi Atoll before returning to the United States via Pearl Harbor. The carrier arrived at San Francisco, California, on 29 November. After a six-week overhaul during which her battle damage was repaired and additional 40-mm guns were added to the ship, Belleau Wood headed back to the fighting in January 1945. The ship returned to Ulithi, arriving there on 7 February. Three days later, Belleau Wood joined Task Group TG 58.1 for raids on the Japanese home islands and to support the US Marines on Iwo Jima. The rest of the war was spent on further attacks on targets in and around Japan. When the war finally ended, Belleau Wood’s aircraft participated in the enormous aircraft flyover that followed the formal surrender of Japan on 2 September 1945. After supporting occupation operations into October 1945, Belleau Wood transported US service personnel back to the United States until early 1946. Generally inactive from then on, the ship was decommissioned and placed in reserve at the Alameda Naval Air Station, Alameda, California, on 13 January 1947. 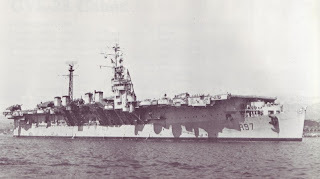 Belleau Wood remained in “mothballs” until she was transferred to France on 5 September 1953 under the Mutual Defense Assistance Program. 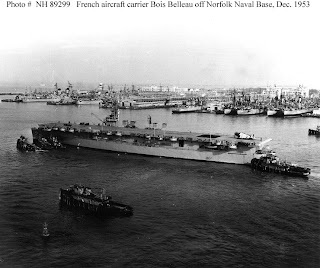 After being renamed Bois Belleau and serving in the French Navy until early September 1960, the ship then was returned to the United States. The carrier was sent to the Philadelphia Naval Shipyard and remained there until 21 November 1960, when she was sold for scrapping. 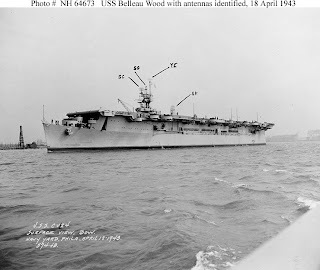 USS Belleau Wood received 12 battle stars for her service during World War II.